How to Fill the OMR Sheet in the NEET 2019 Examination? 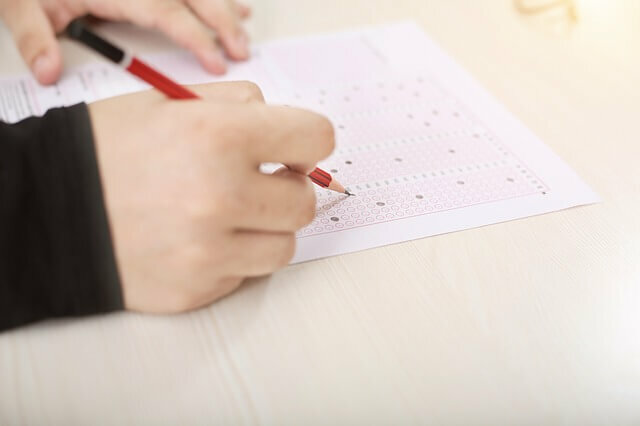 How to Fill the OMR Sheet in the NEET 2019 Examination? How to Fill the OMR Sheet in the NEET 2019 Examination? Filling the OMR sheet after solving entire paper or after each question? No it’s never after solving entire paper, nor after solving each question. It increases the chances of mistakes as you will be filling a bulk of 180 questions at a stretch. You will be always worried while solving the questions that you have to fill the OMR sheet too. Reasons for not following the second method is that if you fill the OMR sheet after each question it takes your attention out of the sheet, plus if you don’t answer consecutive questions and if you have skipped a question in between and if you have the habit of filling the OMR after each answer then it is very likely that you will fill the previous consecutive question that you had skipped in the question paper. So my method of filling it was that I used to complete one section say Physics and fill the OMR of that section and then proceed to the next. This saved me of the worry that I will have to keep time to fill the OMR sheet at the last, plus it was more efficient way as it helped reduce mistakes. Try to keep yourself at the safest side possible. PS : The image used above is for representational purpose only. In the NEET exam, you will be given pen instead of pencil to fill the OMR sheet. Aditya Vikram Santhalia is an MBBS 3rd year student at Institute of Medical Sciences, Banaras Hindu University, Varanasi. He cleared NEET and AIIMS in 2016 with AIR 187 and AIR 101 respectively.